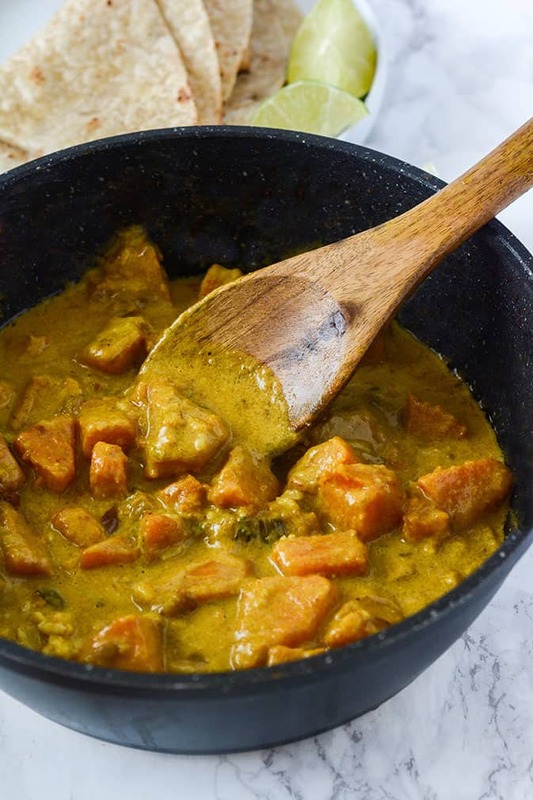 Butternut Squash Coconut Curry is one of the easiest, quickest and most tasty dishes that you can prepare in under 30 minutes. Transform delicate butternut squash into this bold-tasting dish that becomes a culinary masterpiece in minutes. It's one of those dishes that you can take to a potluck and there won't be any leftovers. Serve it with rice or in a gluten-free wrap with lettuce, tomato. and cucumber. Butternut squash keeps for pretty long on my counter, so I always love to use it to decorate my countertop during the fall season. It helps to add that warm and cozy feeling to our home. 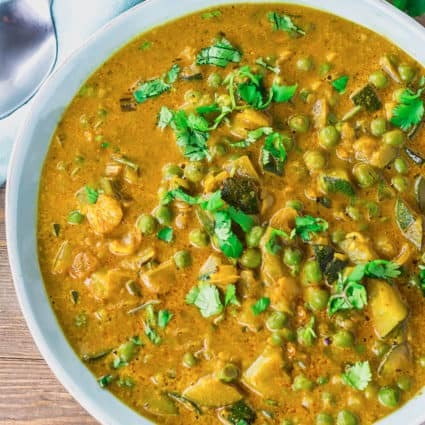 I consider myself to be the queen of making simple and easy curries that are perfect weeknight dishes that the entire family will love! Check out my Black Bean And Butternut Squash stew! Here is a list of some of my other delicious curries. To make Butternut Squash Coconut Curry, peel and cut butternut squash into cubes, saute the onion, garlic, ginger, curry powder, paprika, and thyme. Add butternut squash cubes and stir to coat. Add coconut milk, veggie broth and cook until squash is tender. Stir in salt and pepper and serve. 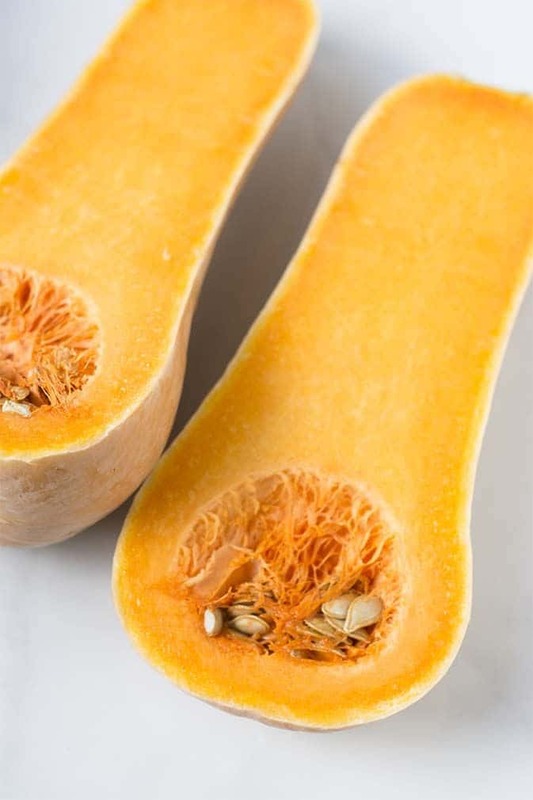 I love the flavor of butternut squash, which makes a great addition to soups and stews. As you may have noticed, in a lot of my recipes I tend to include thyme as a part of my seasonings. Thyme for a Jamaican is like basil for an Italian. It's an integral part of our cooking and we use it in most of our savory dishes, if not all. So I had to include thyme in this curry! Heat oil in a large saucepan on medium-high. Add onion, garlic and ginger. Cook until onion is soft, about 3 minutes. Stir in curry powder, paprika and thyme. Cook for 1 minute. Stir in squash, coconut milk, vegetable broth. Bring to boil, Cover and reduce to a simmer on low heat. Cook for 15 minutes until squash cubes are tender but not mushy. Stir in pepper, salt and cilantro. Lovely curry, easy & quick to make, slowly converting a meat eating husband to the delights of vegetarian. Nuala, I’m so happy it turned out for you. Thank you for your feedback. Honestly, I make this dish atleast once a week! It’s my go to! Thank you so much!!!! That’s so wonderful to know Liz, I’m happy you enjoy it. Thank you very much for your feedback. Joe, I so happy it turned out great for you and you enjoyed it. 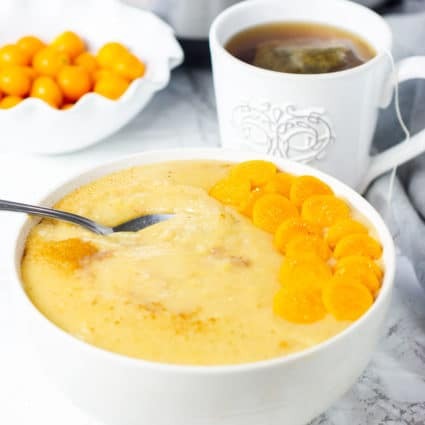 Thank you for wanting to try my other recipes! Just what i was looking for and can’t wait to try it out! Uncomplicated, easy to follow recipe with simple ingredients. WILL IT FREEZE? Dee, I’m happy you found my recipe. Yes, it can freeze. Looks tasty and yet easy to make. Leica thank you, hope you try it. This is great! I will be sharing this with my clients! Thank you Jasmine, I’m happy you love it and thank you for sharing. Tara, I’m so happy it turned out well with your adjustments. I have used turmeric many times in the past but I usually add cumin and coriander to round it off. Thank you very much for your feedback. Omg this curry is absolutely amazing. So tasty. Will definitely be saving this recipe. Thank you!! Thank you Lucy for your feedback. I’m so happy you enjoyed it! Amazing. I made this and I couldn’t stop eating it. So flavorful and satisfying. That’s wonderful to read Jess, I’m so happy it is one of my favorite recipes. Very easy recipe and it tasted great! Has this for dinner tonight. It was wonderful! I did add a bit more cinnamon (it was an ingredient in my curry) and used chicken broth instead of water. Will definitely make it again. Thank you Jan for your feedback, so happy you enjoyed it. This sounded so good, but unfortunately it was one of the worst dishes I’ve ever made. I used sweet curry and the taste just wasnt there. I tried to doctor it up but I didn’t go in the right direction. It smelled good, but the taste was so bland. Rose so sad that it didn’t turn out right, that’s is exactly why I would not include curry powder in my recipes, I would actually say, turmeric, coriander, cumin and give the amounts, then you would find readers still asking me for curry powder and I have to explain that no two curry powders are the same, they differ from brand to brand and from country to country so the tastes are never the same If I’m going to use curry powder, I only use Blue Mountain curry powder from Jamaica and Chief from Trinidad, don’t like any other unless I make it myself. If it is bland and sweet, I add extra cumin and cook until thick, add salt and cayenne and that should fix it, the butternut squash and coconut milk are sweet so a savory curry would be better.I will have to now edit the recipe and add the exact amount of ingredients that are needed in the curry powder so the recipe comes out the same for everyone. Just excellent!! Love it! We paired it with quinoa and it was great. Thanks! Awesome, I’m so happy you enjoyed it, love quinoa! I love the fact that you got right to the recipe. It looks delicious. My family enjoys curry meals and I like the fact that it’s vegetarian. Always keep it in the rotation. Can’t wait to try this one. Under 30 minutes, my kind of meal! Thank you Theresa, I love to get to the recipe right away but Google doesn’t love when I do. Hope you enjoy this recipe. I don’t like to make labor intensive meals 9 times out of 10. 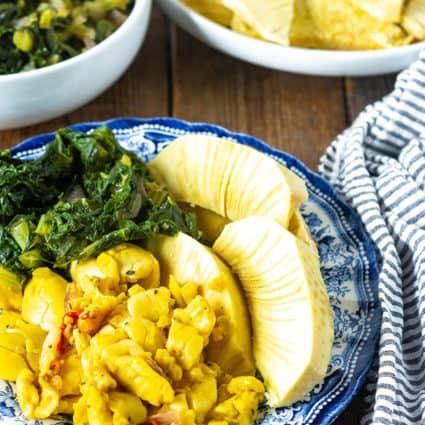 How do I make this a slow cooker recipe? Made this last night! An instant hit – even my 20-month-old loved it. :) Thanks for a great recipe! Awesome Ulla, so happy to hear that even your young one enjoyed it! Any ideas on how to sub out the coconut milk if I don’t have it on hand? You can use water alone instead. If you use oil and you have virgin cold processed coconut oil, then use it to saute the veggies and that will give the coconut flavor. If you eat almonds, then unsweetened almond milk would also work. Thank you very much Cheryl, it’s 1 medium onion finely chopped. Hope you like it!